Today’s featured recipe is one of my favorite pasta dishes ever. It was No. 3 on the menu at American Grill, a restaurant in SLC, UT that has been out of business for some time now (sadly). Our family always just calls it No. 3 or Green Noodles, and we all love it. You’re gonna love it to. PS to you parents out there…Cate, my 3-yr-old who has been quite picky about food lately, ate two servings of this tonight!! Saute chicken & mushrooms in a bit of olive oil until chicken is cooked through and mushrooms have released all their fluid and it has cooked off. Cook fettuccine as directed on the package (I use fresh pasta). Drain and set aside. Pour about 1 pint of cream over the chicken and mushrooms and add basil pesto, about 1 small container. 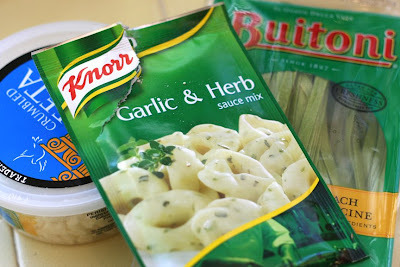 Alternatively, you can use the Knorr Garlic & Herb sauce mix - just follow the directions on the back but use about ⅓ more milk (so 2 cups instead of 1½ cups, for example). Let simmer until sauce thickens. Add the cooked fettuccine, stir well to coat, then add the prosciutto and feta cheese. That looks tasty! I think I remember that restaurant; American Grill. My parents used to go there all the time for their tomato soup. Jane, this sounds (and looks) really good! yum! sounds great. BTW, I served your BBQ chicken pizza the other night to my family…it received rave reviews. Tonight, I’m making the Asian Spinach Pasta Salad..can’t wait to try it. Thanks for your great recipes. I forgot to post my menu this week…I’ll try again on Monday. I know I’m lame for sking but what is prosciutto? And do I have to use it, or does it affect the taste of the whole dish? prosciutto is a dry-cured ham (italian word for ham). it’s a little stronger than ham, very thinly sliced. you could probably throw in a thin ham, but the flavor of the prosciutto is better. you could leave it out, but I have to say one of our favorite parts of the dish were the prosciutto bites you get every once in a while. it makes it more unique – and it tastes GOOD. you can get prosciutto almost everywhere nowadays. I usually get it at Trader Joe’s b/c it’s a little cheaper. It comes in small packages in the prepared meat section usually. Their tomato soup was the BEST!!! BTW = this is not Bill from Jersey – this is MAWA.. Speaking of a ‘fresh’ cream sauce – allow me to add one more comment about #3. When I make this I like to use the ‘from scratch’ cream sauce. Mix and add that to the sauteed chicken, mushroom and prosciutto – set aside. This allows the flavor to infuse the chicken while the sauce is made. I then add cream (yes, real cream) to the pan drippings and slowly cook until it is of sauce consistency. ‘break’ the sauce by over heating. Very similar to Jane’s version but richer – and of course higher in calories. You will have to decide if the calories are worth it. I, the butter queen, think they are….although both versions are DELICIOUS! This is going on my menu for this week!! Yum! Another great idea, thanks for sharing! Jane, I’ve been stalking your blog on and off for a couple months now and I just had to try this recipe. I made it tonight, using regular fresh fettucine and omitting the mushrooms. It was FABULOUS! Thanks for sharing such great recipes on your site! I can’t wait to try more! jane, i was just browsing the newly organized recipes 🙂 and have always wondered where to find the spinach fettuccine pictured here! i’ve looked at all the grocery stores with no luck…but we’re in washington state so you might have a different one. ????? you know what? my grocery store stopped carrying it recently! 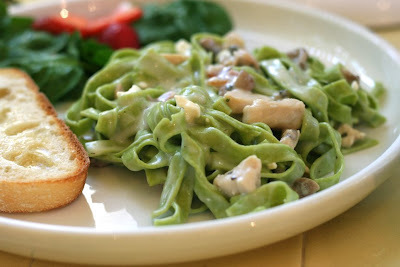 which kills me…this recipe and another have spinach fettucine and it really makes a difference in taste. so…I’m on a quest. if I find a good source, I will let you know. and vice versa!! what I find is as soon as I drain the water, I keep the pasta moving until I can get some butter or oil on the noodles…and if it’s something like this recipe that it’s going to get mixed with a sauce, then I get the sauce added to it as soon as the water is drained. My wife and I love this dish. Thanks for sharing it! I hate to be dense, but do I add the noodles to the pan after cooking? I’m so confused! not at all dense – I wrote this recipe up ages ago, should probably re-write and re-photograph it! 🙂 ANYWAY…I went in and clarified the directions a bit, based on how I prepare the dish. You can add the pasta to the sauce and mix it all together (which is what I just added to the recipe). You can also serve the sauce over the pasta on plates, but I like mixing it all together. Hope that’s helpful! Thank you for commenting!